2-10 Home Buyers Warranty has said to protect more than 5.5 million new and pre-owned homes, partnering with some of the nation’s finest home builders, real estate professionals and service contractors. In the business of “promises kept,” the company promises to keep its customers happy and relentlessly focusing on reducing the risks of financial risks for its customers. How much does a 2-10 home warranty cost? According to the official website, the warranty service agreement “covers the repair and/or replacement of the home’s major systems and appliances, including both parts and labor.” Warranties which cover your home’s systems and appliances, which we go more into detail below, are said to be anywhere from $350 to $600+ per year, with a deductible ranging anywhere from $50 to $100 every time you make a service call. Adding in additional coverage options, such as additional refrigerators or a roof leak, to name a few can increase this cost. In conclusion, for a basic home warranty from 2-10, be prepared to spend $350 to $600+ per year, but if you were to add additional coverage options to your policy, it wouldn’t be unheard of to have your policy reach more than $1,000 a year. These additional fees are said to add yet another $60 to $100+ per item, per year. As with any home warranty, the costs will depend on what you want to be covered, the size of your home, the type of home and the deductible you choose. On this HomeWarrantyReviews.com review page for the company, for instance, a few commenters, albeit not confirmed, stated they paid close to $1,100 a year for two homes, whereas another commenter said they paid $99 a month for more than six years. On average, the average premium ranged anywhere from $305 to $600, with the average deductible in the $60 to $100 range. Via this Yelp.com review page, for instance, one reviewer said he paid an additional $100 to upgrade to the “supreme” package and another $160 to add his pool and spa. According to one member on this City-data.com forum thread, he was quoted $300 a year and $50 per service call, while another was quoted $450 per year, with a $200 deductible. Covered systems, as per the official website, include the air conditioner, furnace, plumbing, water heater and the electrical panel, while covered appliances include the refrigerator, oven, dishwasher, built-in microwave, disposal, trash compactor and the washer and dryer. These inclusions are subject to change but seem to be standard for most home buyer warranty inclusions. The company also offers a “new home 10-year structural warranty” plan that’s designed for newly constructed homes and covers load-bearing components such as the floor framing, columns, beams/girders, footings/foundation system, load-bearing walls, partition sand the roof framing system. For this type of warranty, the company does note that it can only be purchased by the builder who is a member of the 2-10 HBW. 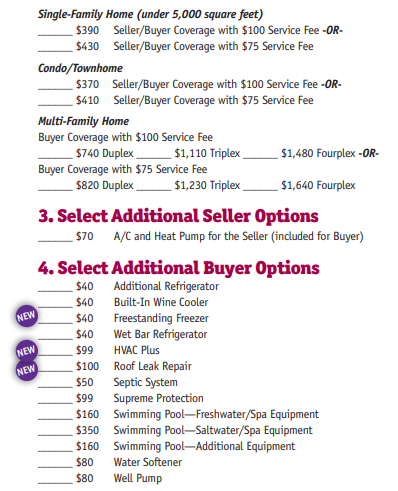 As with any home warranty company, additional options can be added to your policy for an additional fee, including a pre-season HVAC tune-up, extended pipe leak, additional refrigerator-type appliances, a roof leak, septic system, pool equipment, water softener and/or water pump. If you were to add the pre-season HVAC tune-up to your policy, for instance, then the company would have one of their preferred service contractors come to your home, either in February and March or October and November, to perform a tune-up on two HVAC systems at the address on file. On Yelp, at the time of this publishing, 200+ reviewers gave the company a 1.5 star out of five stars, with a large amount of the reviewers complaining about the lack of communication, the actual coverage provided and the “reputation” provided. The official BBB page gave the company an “A” rating; however, 97% of the reviews were negative. We usually do not include the BBB reviews as the company as the company in itself is unethical, it allows you to explore more in depth as to why people complained about their warranty. HomeWarrantyReviews.com had close to 2,000+ reviews, with an average 2.5 out of five-star rating.